Like millions of others, I was browsing the iPhone 2.0 applications on iTunes last Friday. 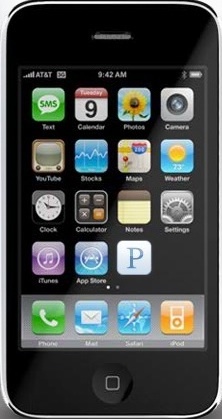 I got my iPhone on June 30th, 2007, the first day it was available. I have been giddy over it ever since, but am comfortably encased in my talk and data plan, and don’t see enough of a benefit to switch to the 3G, at least not at this time. I spend more time on SMS, talking to people (yes you can do that on a phone), managing my calendar and contacts and using the applications than surfing the web. The extra speed would be nice, but not the additional expense. 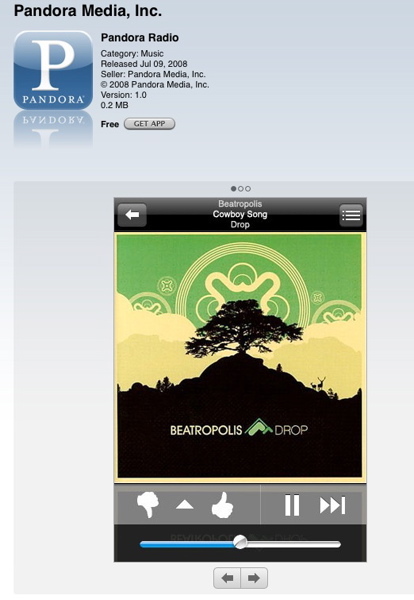 While on the iTunes applications site I came across the Pandora application. I’m a big fan of Pandora as you can read in a previous post here. I have spent some time setting up stations so I can listen to them through my G5 Mac as well as on my Sonos music system. The Pandora iTunes application is seamlessly integrated with your web settings, and allows you to log in and gain access to all the stations you have set up through your computer. So now I can access the Music Genome Project where ever I go. Love it. The Pandora application is free. Get it, use it. It rules. I enjoy listening to Pandora stations on my iPhone but I also found this really cool gadget that lets me broadcast the Pandora music to any regular radio in my house. I found it here: http://www.usbfmtransmitters.com . Thanks to everyone for sharing their tips.